During their temporary cease fire, Israel and Hamas are negotiating in Cairo, Egypt, for an agreement to end Israel’s third military assault since 2007, on Gaza. Thursday night, Ha’aretz reported that the talks were “stalled”. Friday morning, when the 72 hour agreement ended, the New York Times reported both sides resumed cross-border firing. These shots could be “warning shots” to signal a resumption of the conflict, or they may be part of the negotiations strategy on both sides. The conflict is asymmetrical, suggesting that more exchanges of fire would be especially harmful to the Palestinians in Gaza. The one-sided nature of the now 30-day conflict, is seen in the human toll of Israel’s third “mowing the grass” project in Gaza. Thus far, Israel has killed 1900 Palestinians, the great majority of whom were civilians, including 400 children. To agree to an extended cease fire with no more firing from either side, Hamas, the ruling government of Gaza, has laid out its simple requests. There is nothing radical nor threatening about them. On its side of the negotiations table, Hamas has asked for a return to the “normalcy” of 2007, opening the borders and allowing Palestinians to fish further out into the sea, and tilling their farm lands. The Times of Israel is live blogging developments, as seen from Israel’s perspective. If an extended cease fire agreement is reached, and Israel agrees to Hamas’ simple requests, the firing from both sides would end, at least for a time. Is there any hope that Israel will agree to the Hamas requests? Based on Israel’s past record of negotiations, the possibility that Israel would relinquish its tight control over Gaza is slim, at best. If Israel does reject Hamas’ simple request for normalcy, a request that would involve the removal of Hamas’ tunnels and rocket firing equipment, that rejection would testify to the world that Israel has no desire for the Palestinians of Gaza to ever again return to what was the normalcy of 2007. Even if the siege is eased or lifted — and there’s no sign yet that the troubled search for a truce would produce such an outcome — rebuilding Gaza’s economy will remain a formidable challenge”. Normalcy would still be a long way off, thanks to the ferocity of Israel’s invasion. “You cannot say there is an economy right now,” Omar Shaban, director of the PalThink Institute for Strategic Studies, [told America Al Jazeera] last week. There is also formidable opposition to any proposals from Hamas among Israel’s American loyalists who share Israel’s lack of interest in granting normalcy to a Gaza under Hamas leadership. Former AIPAC staffer MJ Rosenberg, now a harsh critic of Israel, points to one of those formidable opponents: The blind obedience the U.S. Congress displays whenever it is told to jump through an AIPAC hoop. Rosenberg reports that because AIPAC wanted the Congress to endorse Israel’s attack on Gaza, a vote was taken to send additional funds to strengthen Israel’s Iron Dome defense. Late last Friday night, the House of Representatives considered the Senate bill that allocated the additional $225 million to Israel. The bill passed the House 395-8. There was no debate. New York Times columnist Thomas Friedman, crown prince of the media’s liberal Zionist kingdom, took to his pulpit with a sermon that “explained the Israeli invasion”. Friedman has completely absorbed the Israeli version of reality. His sermon drips with the jargon of Benjamin Netanyahu. KIBBUTZ EIN HASHLOSHA, Israel — At 6:02 a.m. on Saturday, the air raid siren sounded over Tel Aviv. I was rousted by the hotel staff from my room and ushered into the windowless service elevator area with two French families, everyone in their pajamas. On the same Saturday morning Thomas Friedman slipped beneath his blanket in the hotel room he occupied near the Gaza border, an Israeli bomb destroyed the home of a large Gaza family. Despite the cease-fire, A. (name redacted) remained in her home yesterday and did not travel with her husband to the Shabura refugee camp in Rafah. She couldn’t bear the thought of the emptiness she would find there instead of the three families of relatives who had lived there in their simple asbestos dwellings until a single bomb fell on them Saturday morning. “Did you know that Fathi’s [Abu Ita] three children who were killed were geniuses? Like their father, like their uncle Yakoub, the mathematician,” she said yesterday, as she delivered a lengthy report about her relatives who were killed, her work colleague who was killed, those who were wounded, those whose houses were destroyed this time, those whose houses were destroyed for the second time, those who were buried with their bodies whole, and the children killed whose body parts had to be collected. The contrast between Friedman and Hass demonstrates why liberal Zionism has lost all credibility. Friedman is oblivious to the suffering near by, while Hass reports the evidence of what she sees and hears in a devastated Gaza. In contrast to Friedman, BBC television host Jon Snow was in Gaza during the height of the Israeli invasion. He was horrified by what he saw. Before his heartfelt report, delivered to his viewers from London, Jon Snow interviewed Israeli Prime Minister spokesman Mark Regev after the killing of four Palestinian boys playing soccer on a Gaza beach. It is broadcast journalism at its best. Will Hamas get its desire to return normalcy to the Palestinians of Gaza? Will the cease fire be extended? Only Israel, and its Washington allies, know the answer to those questions, because Israel is the military power dictating the future. 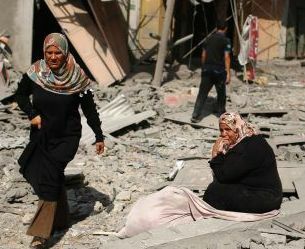 The picture above of a Palestinian woman sitting in front of what was once her home in Beit Hanoun, appears in Ha’aretz. It is a Reuters picture. This entry was posted in Media, Middle East, Middle East Politics, Netanyahu, War. Bookmark the permalink. Israel has the US in its pocket and knows it. there will be no sanctions of consequences to Israel for the massacre of civilians. Only the people, who should never buy a single Israeli product or invest in any Israeli firm might have an impact. It would be a people’s sanction of the bloody, racist nation that Israel has become. It has no regard for the lives of Non Jews, and it’s religious establishment there has encouraged the killing of women and children. Churches, as usaulal, are as silent silent as lambs or else the hopeless “christian zionists” give loud support to the apartheid state. Once again, due to our Congress’ vote in support of this slaughter and our Presidents lack of backbone in condemning it and taking action to help the people of Gaza for eight years, I am ashamed to be an American. to add a note – my sense is that a good deal of the fighting over the past month was – as is the case now – over the terms of the ceasefire. Israel and the Obama Administration wants a ceasefire that goes back to the pre-fighting status quo with Gaza sealed off to the world. The fighters in Gaza, Hamas and otherwise, refuse to accept this, in part because of the horrific casualties, in part that the ending of Israel’s war on Gaza lead to a new security situation where the Gazan-Palestinians have more breathing room and open passage of people and material in and out of the zone. The previous ceasefires offered, which Israel accepted and the Palestinians rejected, refused to change the status quo. Some of the intensification of the bombardment was to punish Hamas for not accepting “their fate”. I would also point out that if the Obama Administration pressured Israel the two Gaza entry points would be opened, but to date, despite a few encouraging words (by Obama yesterday) suggesting a U.S. shift in that direction, no such pressure has been in applied. Your description of the situation and various factors that play into it are right on, and I especially liked your exposure of the cowardly “camouflaged Zionist” journalist, Thomas Friedman. It seems to me that there is no way the Palestinian resistance in Gaza will accept going back to the status quo. They figure that the “status quo” means even more hideous strangulation of the people of Gaza. This is unacceptable by anyone who believes in Freedom and human rights. They prefer to fight and die, rather than be subjected to a horrendous slow-death. I would not be surprised if war-criminal Netanyahu & Co. take full advantage of the stand of Palestinian resistance, since they have been urging to “finish the job in Gaza”, as demanded by the vast majority of Israelis. Israel is heading towards “genocide-by-increments”, which along with ethnic cleansing, has been its strategy since its destruction of over 500 towns and villages in 1947-48 and the creation of Israel by dispossessing the Native Palestinians..
Jim, bless you and your Palestinian-like sumud. I could only laugh bitterly during the Tapper-Baskin interview at the subtle and not-subtle references that Hamas is expected not to rearm and indeed to demilitarize. Well…that sure doesn’t extend to the other party to this conflict, does it? — as we US taxpayers foot the bill of re-arming a military behemoth clothed in victim’s attire and bullying its criminally psychotic way through the once-“holy” land. Indeed, as is Fred, I am ashamed to be an American. Viva Palestine!